At this point, it’s common knowledge that Donald Trump isn’t exactly one for studying, but even the Donald has to prepare a little. Which is why now, for the first time ever, we’re giving you an inside look at Trump headquarters as his team readies their candidate for tonight’s debate. 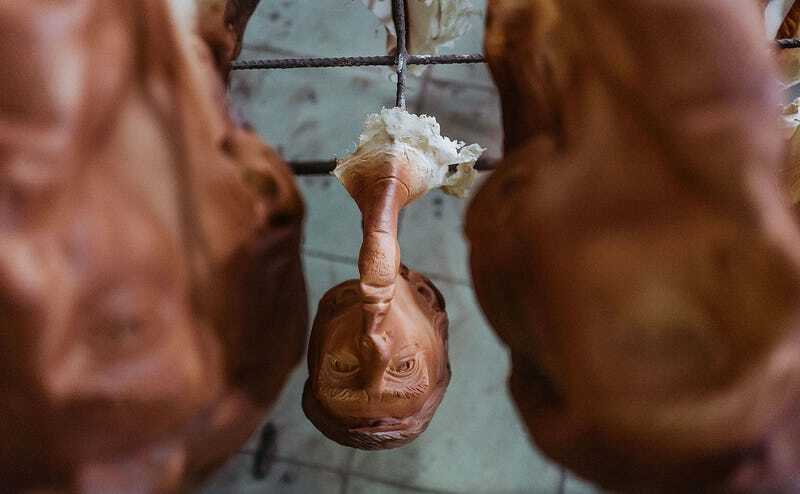 A disemboweled Trump is laid out to dry. The mask all the way on the left is his heart. A tan fit for a president. Here, Donald Trump receives a final squirt of makeup. He’s beautiful now. “You’re fired,” Trump says, getting a few laughs in with his handler before the man leaves to file for unemployment. The various Trumps hang back for a minute of quiet reflection. The handlers have had their way. He has been extensively prepared, molded for the occasion. Our boy is as ready as he’ll ever be.